BAYOU PURIFICATION | gURROO - A new generation of innovative minds. The Gulf of Mexico was devastated in 2010 by a horrible Oil Spill. The global media is giving this catastrophe less and less attention, but the dangers of this spill are still very real. 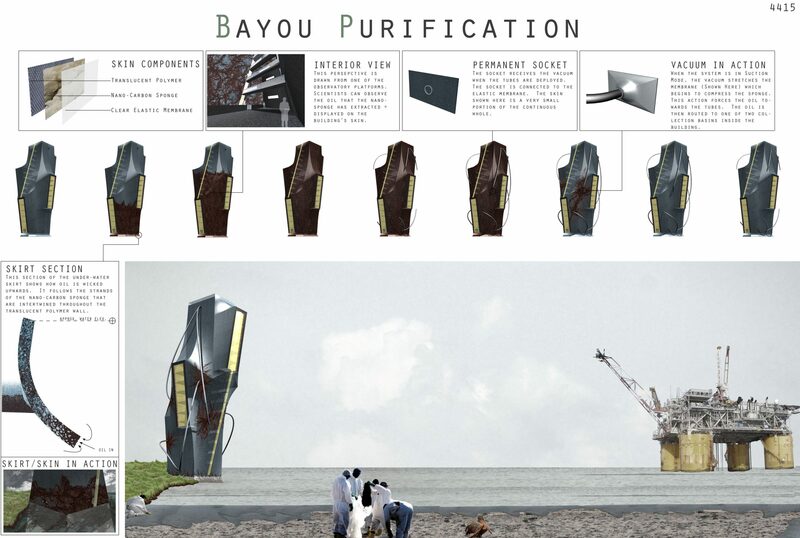 “Bayou Purification” is a 17-story Alternative Energy Research building that pro-actively seeks to assist in the cleansing process, and remind the world that this spill is an ongoing issue that demands attention. This is Architecture that improves the environment! The curtain wall that wraps the building contains continuous strands of a carbon nano-sponge. This sponge was recently developed by Chinese scientists, and large scale production is currently being investigated. The sponge uses capillary action to extract oil from water, while remaining un-penetrated by the water. 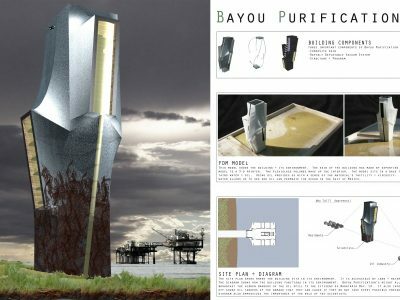 “Bayou Purification” boasts a composite skin that has a version of the nano-sponge intertwined throughout a polymer wall. This portion of the skin is then wrapped by a clear elastic membrane. When assembled, this skin has the ability to continuously wick oil upwards. Once the skin has received enough oil, a vacuum system is deployed in order to extract the oil from the skin, and into one of two collection basins. All of these activities are clearly visible by people for miles around. 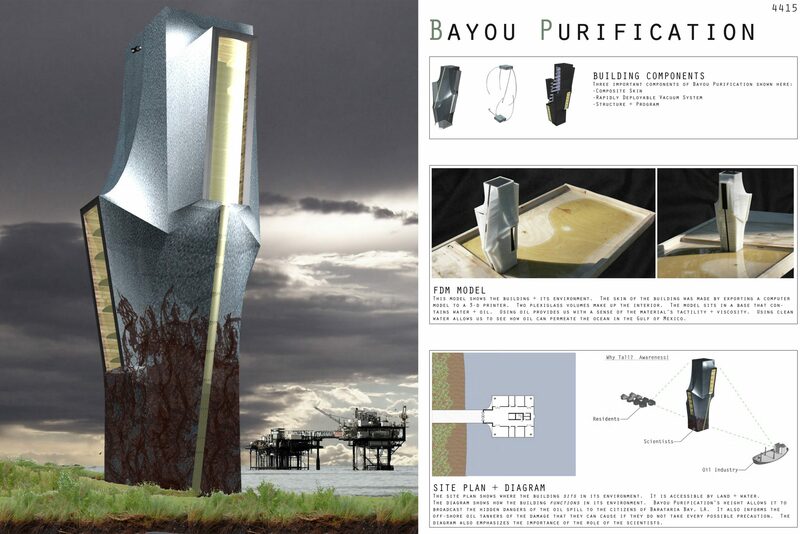 “Bayou Purification” has the ability to address three major issues. 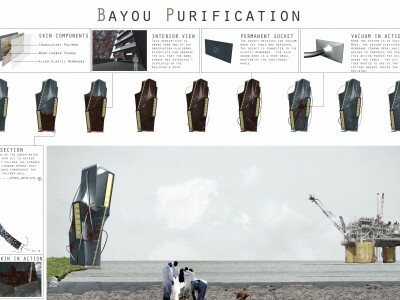 “Bayou Purification” is proposed for Barataria Bay, Louisiana. It will continuously remind the world of the dangers of our dependenceon oil. This building serves as a bold catalyst for Alternative Energy.